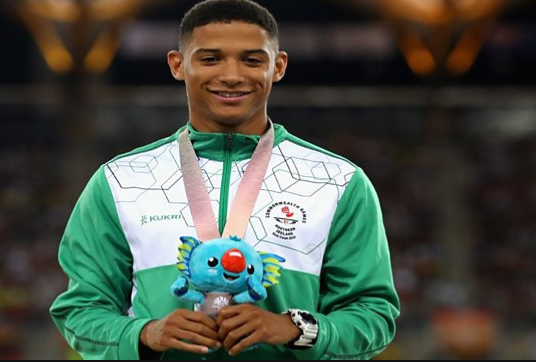 Five weeks after winning Northern Ireland’s first Commonwealth Games athletics medal since 1990, 200m runner Leon Reid is talking about his sometimes hazy childhood memories. Those 14 different foster homes were dotted all over the English midlands and West Country. “Birmingham, Wolverhampton, Nottingham, Gloucester, Bristol… all over especially when I was younger,” recalls the 23-year-old. “Different families. Different brothers, different sisters, different schools. They would move you around a lot. I’d be in a different school every other year. Trying to make friends. It was sport really that kind of grounded me.” Reid puffs out his cheeks at one point and you wonder whether you’ve pressed him a little too much. But he keeps going, explaining how he empathises with the upheaval his arrival maybe visited on some of his foster families. Reid’s Belfast-born mother Anne-Marie had moved to Bath with her parents and it was his grandparents who maintained the young Leon’s connection with his birth family after he was placed into care as a baby. “My mother had her own difficulties. We tried to stay in touch (the two of us),” recalls Leon of his birth mother who passed away in 2016. But it was a case of “in and out” of foster home after foster home for the first decade of Leon’s life although a schoolyard scrap at the age of six started an unlikely chain of events which led to him finding a stable family environment. Within five years, he was the adopted brother of the young boy he had fought with.”That day, we were best friends by lunchtime. “From then, it was a case of staying around Ryan’s house every other night. His mum (Claire Russell), my mum now, got us put in the same football team together. We were just inseparable. “My mum went through all the legal battles and by the time by I was 11, she was my mum and I had a brother Ryan and a sister Olivia.” With Claire hailing from Enniscorthy in Wexford, the young Leon got quickly used to regular family trips to Ireland. Leon Reid took won European Junior and Under-23 silver medals for Britain.